"Commander-in-Chief 大都督 (dà dū dū)"
Nicknamed "Zhou Yu the Fair" for his good looks, Zhou Yu was the most famous of all Sun Wu 孙吴's advisors. Both a military general and a strategist, he became Sun Quan 孙权's able right-hand man and was the brains behind the battle of Red Cliffs 赤壁之战. Unfortunately for him, Zhuge Liang 诸葛亮 is just too incredibly clever. Despite coming up with schemes to rid Zhu Ge Liang, Zhou Yu simply cannot outsmart the unrealistically intelligent Zhu Ge Liang. The story seems to downplay Zhou Yu's achievements and make him seem second class and inferior to Zhuge Liang. Yet Zhou Yu's contribution to Cao Cao 曹操's defeat at Red Cliffs is incredibly significant and has guaranteed him a place both in the history books and in semi-fictional accounts of the era. 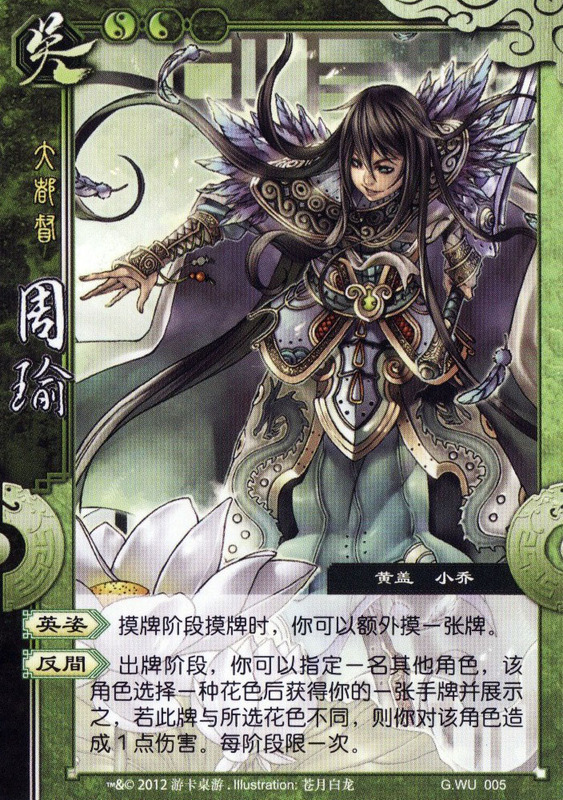 Character ability 1: "Heroic Demeanor 英姿(yīng zī)"
When you draw cards during your drawing phase, you can draw one additional card. Character ability 2: "Sow Dissension 反间 (fǎn jiàn)"
During your action phase, you can choose another player to pick a suit. This player then acquires one of your on-hand cards and reveals it to everyone. If the suit of the acquired card is different from the suit he/she had chosen, you cause 1 unit of damage to that player. Limited to once per phase. “Sow Dissension” has been changed such that the victim acquires the on-hand card before receiving damage. Zhou Yu cannot get back the card if he kills another player by “Sow Dissension”. But the really obvious difference is Zhou Yu's unbelievably hideous portrait. What in the world were they thinking?!?! Ok although history states that Zhou Yu was a handsome young man, but I don't see why he should get to draw 3 cards for being good-looking. So I'm bullsh*tting any connection this has to the story. "Sow Dissension" is comes from a significant event leading up to the battle at Red Cliffs, where Cao Cao is tricked by Zhou Yu into executing the only 2 generals with experience at naval combat, Cai Mao 蔡帽 and Zhang Yun 张允. Unfortunately, that too has nothing to do with how the ability is played in the card game. 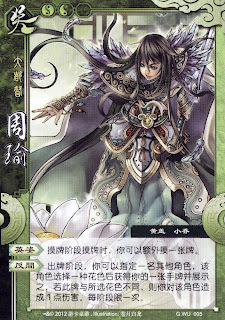 In SGS, characters resourceful in terms of appearance and wealth get to draw more cards, so it is not surprising that Zhou Yu can draw more cards. The same theory applies to Diao Chan. The mechanism of “Sow Dissension” was pretty interesting. It allows your opponent to steal your letter (an on-hand card). If it is a fake (a wrong suit is guessed), it hurts. Hi, can anyone please tell me the difference between kingdom wars and normal sys? The difference between these two card games are quite a lot but I explain it anyway. Max. no of players can play is 2 to 10 players. There are 4 roles total that are King , Loyalist , Rebels and Spy. You can use only 1 character to play. Max. of no of players can play is 2 to 12 players. There are no roles but there is only 1 role just in case there are a lot of people who teamworks and make sure it balanced game. (For example, there are 8 players in a game, but there are 5 WEI who teamworks. So in this case, the last WEI person who exposed will be not in the same team with the WEI. You must use 2 characters to play the game with the same alliance. And they must be closed and not exposed. They can only exposed their characters under some circumstances. The reward for killing also different from the Kingdom Wars. Oh, I almost forgot, there are also got Synergistic Partners and some extra cards in the Kingdom Wars which not found in normal SGS. I explained already in this website corcerning about it. My comments there.